Acclaimed by audiences and critics alike, Billy Elliot The Musical, with a score by Elton John, has now been seen by over 11 million people across five continents and is the recipient of over 80 awards internationally. This touring production coming to Milton Keynes Theatre next week will see four boys share the lead role. They are Lewis Smallman, Emile Gooding, Adam Abbou and Haydn May. Set in a northern mining town, against the background of the 1984/85 miners’ strike, Billy’s journey takes him out of the boxing ring and into a ballet class where he discovers a passion for dance that inspires his family and whole community and changes his life forever. To make the story work, exactly the right cast is essential. The Billys are particularly crucial and Stephen’s team operate an intensive training programme known affectionately as Billy Camp purely to equip the boys with the ability to act, ballet-dance, tap and cope with the demands of the show often before their voices have broken. Stephen said: “That training can sometimes take two years. At the end of the programme we have equipped the young men with a set of skills they can use in all sorts of different ways. It runs from Tuesday May 30 through to Saturday June 17. 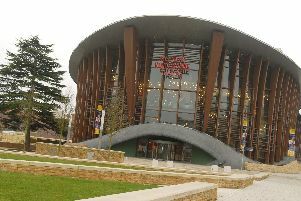 Tickets from £18.50 from the box office 0844 871 7652 or book online at www.atgtickets.com/miltonkeynes.